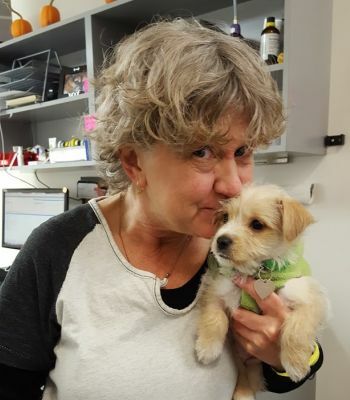 Donna M. Sisak is a 1991 graduate of Harcum College in Bryn Mawr, PA. During her 30 years in the veterinary profession, she has worked in small animal hospitals throughout Pennsylvania. 1991-95 she worked in the nursing department (general and intensive care) at the Matthew J. Ryan Veterinary Hospital of the University of Pennsylvania. In 1995, Donna transferred to the anesthesia department of MJR-VHUP where she performed clinical anesthesia and supervision of veterinary students and veterinary nursing students during their anesthesia training. For 13 years, Donna had been the Department Supervisor of the Harcum College students during their two week rotation of their three month practicum at MJR-VHUP. She has been the recipient of the Veterinary Teaching Award for six years. In addition to her teaching responsibilities at MJR-VHUP, she has taught the anesthesia portion of the pharmacology class at Harcum College from 2000 – Spring 2008. In 2006, Donna became a member of the Academy of Veterinary Anesthetists by passing the nationwide exam for the specialty of Anesthesia. In the Spring of 2008, Donna pursued her professional interests in the Pacific Northwest. As of April 2008, she has become a member of the team at Seattle Veterinary Specialists in Kirkland, WA. She is excited to be part of SVS and will continue with her focus on her specialty – anesthesia and teaching - in addition to other areas of veterinary medicine – surgery, critical care and pain management. In February 2017, Donna became a member of the Aratana Technician Council of Experts (ACTE) Pain Board. The ATCE board will be a valuable resource for better understanding how Aratana (Nocita - bupivacaine liposome injectable suspension) can connect and resonate with all clinic staff members regarding post-op pain management. Her lecture experience includes IVECCS, AVMA, AAHA, NJVMA, Annual Penn Conference, WSVMA, Annual SVS Spring Symposium, and local/in-house CE events. Donna’s professional interests include teaching, pain management, sedation protocols, and respiratory physiology and disorders.